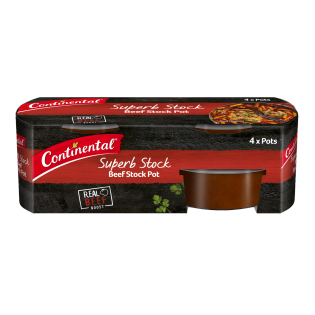 Continental Beef Stock Pot is a rich, concentrated, premium stock that tastes just like homemade stock, and is so versatile. Carefully selected beef, herbs and spices are gently simmered into a flavoursome little pot which melts easily into hot water for a full flavoured stock, or can be added straight to your dish to boost its natural flavour. One pot makes 2 cups of liquid stock. Concentrated beef stock (69%) (water, beef, vegetables (onion, carrot, garlic), herbs, spices), salt, flavours (contain wheat, milk, soybean), yeast extract, sugar, burnt sugar (contains wheat), thickeners (xanthan gum, locust bean gum). Allergens:Contains wheat and milk products. Made on equipment that also processes products containing soybean, peanut, sesame, egg, fish and crustacea. Dissolve one stock pot into 2 cups of boiling water to make a delicious stock for casseroles, soups or gravies. Or add directly to dishes like spaghetti bolognese, stir fries or savoury mince for a rich flavour boost. Love cooking and this product is real quality stock simmered down. no need to add any other seasonings/salt/pepper - it's all in one.